Can you imagine taking your class on a field trip ANYWHERE, without the costs of travel? How would learning improve, if teachers had simple technology tools in the classroom to enable them to connect with experts or interesting learning sources remotely? With today’s distance learning technology, the reality is it doesn't have to cost a lot of money and it certainly doesn’t have to be a complex system. Take for example this 4th grade class. This entire class was able to experience the Baseball Hall of Fame and Museum in Cooperstown, NY right from their classroom through the use of distance learning carts. 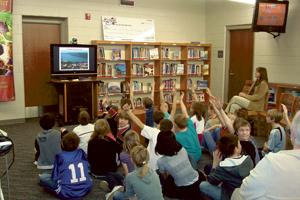 Douglas Hill’s class participated in a virtual field trip in the Media Center at Long Meadow in Rochester recently. It visited The Baseball Hall of Fame and Museum in Cooperstown, N.Y., through the district’s distance learning cart. The technology has an IP connection and includes a flat-screen TV, webcam and microphone. The fourth-grade students learned about baseball players’ with unique abilities such as Detroit Tigers’ pitcher Jeremy Bonderman, who has dyslexia, and former University of Michigan standout Jim Abbott, who was born without a right hand and toured the museum. This lesson fit with the Disability Awareness Day field trip. Interested in the progress of technology in the classroom? Learn interesting details about what classrooms are equipped with today. Download the free report or feel free to ask questions or comment below.